Jays are glowing bright this week. 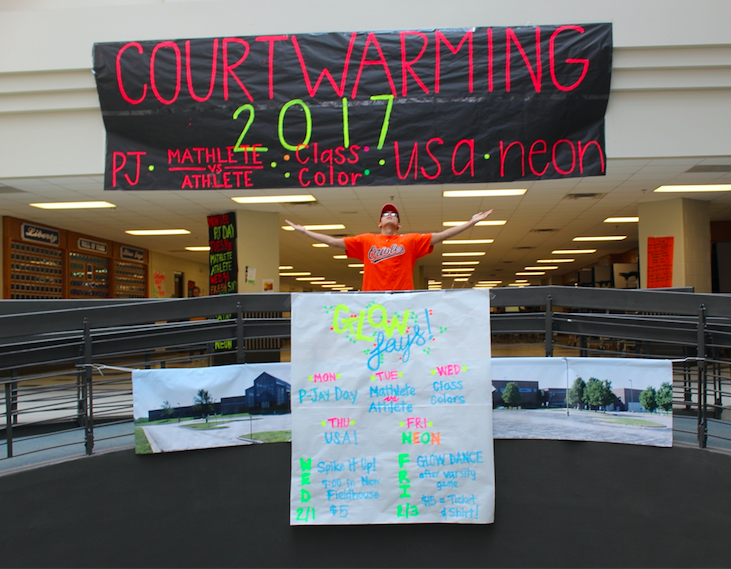 Court-warming 2017 is here and students are prepared. Spirit week started off with fun dress-up days like PJ day, Mathlete vs. Athlete, Class Colors, USA day and Neon colors. Organizations like StuCco and the Leadership class named the days, trying to make them more simple this year to raise participation. It seemed to work. Hundreds of students rolled out of bed Monday morning already dressed for school. To start off the week of Court-warming, it was a favorite that’s been around since elementary school: PJ day. Many different pajamas strolled the halls that day, ranging from silk sets to sweatpants. To some, the students’ clothes might’ve looked similar to every other school day, with a large majority sporting sweatpants or carrying blankets. However, some ambitious students opted to wear slippers, sleeping masks and even full onesies. 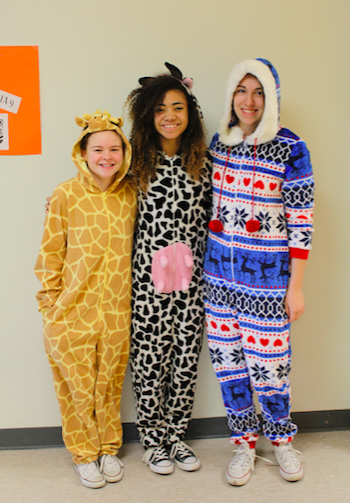 PJ Day participants favored onesies of many different styles. See the slideshow for multiple looks. 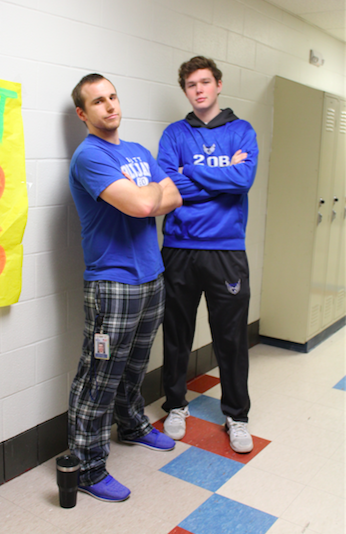 Students celebrated the last day of January by sporting their favorite mathlete or athlete attire. Some real-life athletes dressed the same as they do every day while other students dusted off their suspenders and wore their favorite pair of high waters and white tube socks. Junior Molly Day was especially excited to wear her Royals jersey and hat. “The theatre kids are going all-out this year, eyeblack included,” Day said. The student athletes who just couldn’t pick a side simply split their outfit in half…literally. Junior Briggs Hall was dressed as a mathlete on his left side and an athlete on his right. 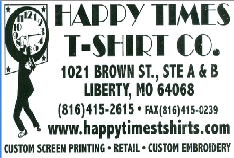 Those more subtly dressed wore shirts from previous Chemathons or state competitions for sports sponsored by the school. Whether a mathlete or an athlete, every student deserves the same amount of acknowledgement. Mathlete vs. Athlete day did just that. Mathlete/Athlete Day featured hometown favorite teams and a few nerdy looks. See the slideshow. Walking down the halls Wednesday, students could finally tell which class their fellow students belonged to. Class colors were either worn with blatancy or like it was just another day at school. Some seniors wore green shorts on this 39-degree day. Pink headbands were displayed by some juniors. The sophomore class wore yellow. A variety of orange t-shirts were seen throughout the freshmen class. Unfortunately, for any student who decided to wear one of the four colors, not purposely participating in Wednesday’s spirit day, they may have been mistakenly identified as belonging to the wrong grade. While this day may not be seen as extravagant as some of the other spirit days, it’s still well liked. “I have always loved class color day primarily because green is my favorite color and I like seeing people dressed how I want them to be dressed,” senior Natalie Schaller said. Another spirit day during Court-warming week was USA day, which took place Thursday. 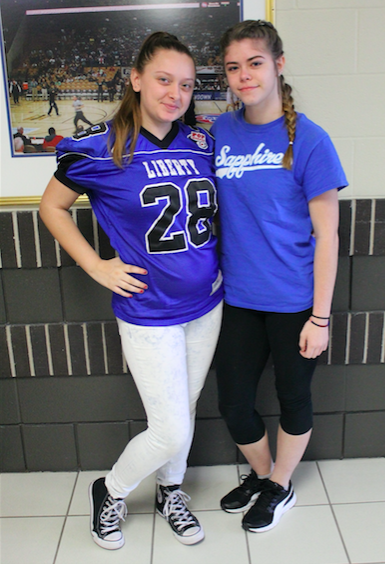 This spirit day was one of the most participated in because of its simple requirements. Some people were creative and some were just wearing an American flag t-shirt, but almost everyone joined in on the fun. 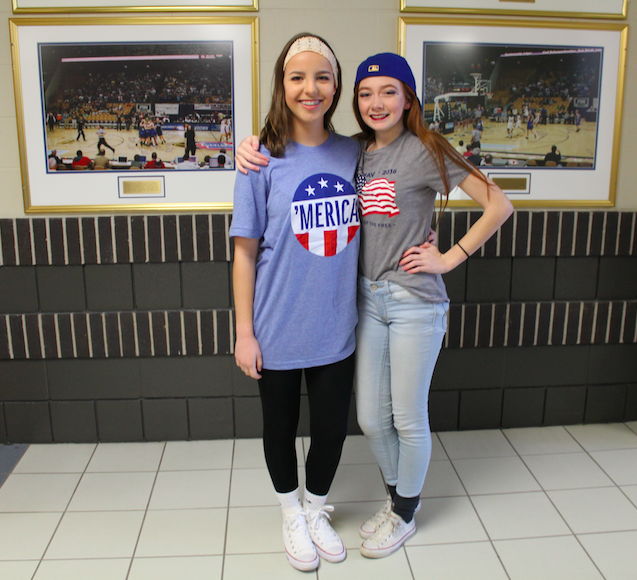 USA Day proved that LHS is proud to be patriotic. See the slideshow. On Friday, students wore their brightest neon clothes to close out this year’s Court-warming spirit week. Neon leggings with neon running shorts were a staple this year. Some students went for more discreet showing of school spirit by pairing their favorite outfit with a pair of crazy neon socks. Whether one chose to go all-out or be more conservative, the school was surely bright. #GlowCrazy has been the theme for Courtwarming for as long as some students can remember. “All four years I have been here the theme has always been #GlowCrazy and it’s just cool to keep a tradition going,” senior Claire Dunlap said. The tradition of Court-warming survived through the last game at Cokely Field House and has continued into the new field house. Students wear what they wore to school to the game. This year, the $15 ticket to the game was a t-shirt students had to wear to the dance. With a week’s worth of effort to get the student body hyped for the game, it’s no wonder the rest of the evening went so well. 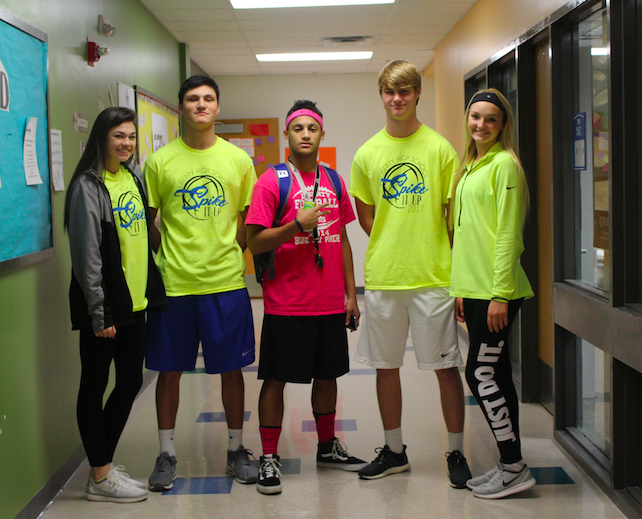 Neon Day featured a variety of colors, but the majority of students were wearing their Spike-It-Up shirts that served as their tickets into the dance that evening. See the slideshow.